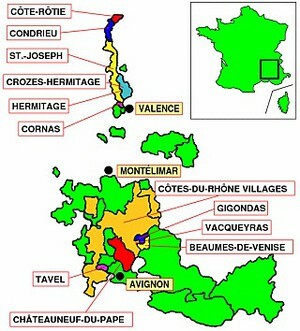 Côtes du Rhône is the most diverse wine region in France. It produces full-bodied reds of Côte Rôtie in the north and Châteauneuf du Pape in the south. It’s known for its memorable whites in the Condrieu region. People spend days going from one vineyard to another on tasting tours. Please remember to have a dedicated driver. The vineyards are situated in the seven communes of Limony, Chavanay, Malleval, Saint-Michel-sur-Rhône, Saint-Pierre-de Boeuf, Vérin, and Condrieu in the French departments of Ardèche, Rhône and Loire, on the steep slopes of the foothills of Château Grillet, and including the fruity red wines of Crozes Hermitage in the southern Rhône region. More than 75% of Côtes du Rhône wines are red. Its range of grape varieties is very much influenced by the terroir as well as climatic conditions; the latter vary from year to year. Soil types influence which grapes are cultivated where. Each different variety has its own character; blending several grape varieties will result in well-balanced, finely tuned wines. In the north, Grenache grapes dominate, however, Syrah must be used for certain appellation wines. Côtes du Rhône is the home of Viognier, a white grape used largely in the north. Clairette is the dominant white wine grape followed by Ugni Blanc and Grenache Blanc.